Due Date, the new comedy directed by Todd Phillips (The Hangover) and starring Robert Downey Jr. (Iron Man 2) and Zach Galifianakis (It’s Kind of a Funny Story), is a retread of John Hughes’ (The Breakfast Club) Planes, Trains and Automobiles with characters who are notably more mean-spirited and selfish finding themselves in on-the-road scenarios that aren’t quite as funny. Robert Downey Jr. (l.) and Zach Galifianakis sit this one out in Due Date. Peter Highman (Downey), a compulsive father-to-be on the way home to Los Angeles to witness his wife’s (Michelle Monaghan, The Heartbreak Kid) induced pregnancy, and Ethan Tremblay (Galifianakis), a shaggy-dog stoner/would-be actor heading out to Hollywood to become a star, meet at the Atlanta airport. A couple of movie-ish wrinkles later, the two find themselves ejected from the plane and sharing a rented car to head across the country to their destination. Peter is disgusted by Ethan, of course, and subsequent situations involving a marijuana buy from Juliette Lewis (Conviction), a side-trip to Mexico and a bizarre encounter in a Western Union office with Danny McBride (TV’s Southbound and Down) don’t help matters. By the three-quarter mark, though, Peter sees the good in Ethan that he has apparently been missing. One of the pleasures of Phillips-directed comedies (Old School, Road Trip) is their laid back approach and overall feel — even The Hangover, with its frantic story and energetic episodes, moves along with a measured, comfortable pace. 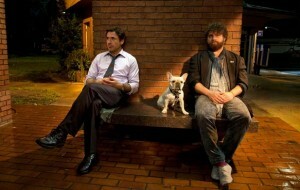 But Due Date lowers the bar from laid back to something I’d describe as almost lazy. Phillips appears to have given his stars a lot of seemingly improvisational leeway in their performances, with at at least a half-dozen scenes feeling like they’re running on a lot longer than they probably did in the script. Sometimes it works, but often it doesn’t, and the hour-and-a-half comedy feels all the longer for it. The sound and vision on the Blu-ray are fine, with the many panoramic views of the boys in their car zipping across the Southwest looking quite beautiful and inviting. Only a handful of bonus features are included on the disc. The gag reel and mash-up montage of the film’s large-scale action sequences are cute, but not as fun as a scene from TV’s Two and a Half Men featuring Galifianakis’ character interacting with the show’s stars, Charlie Sheen (Wall Street) and Jon Cryer (Pretty in Pink). A piece of the scene appears in the movie itself, and is actually a lot funnier than many of the film’s other bits. There’s no making-of featurette on the Blu-ray, but that’s ok, because it would inevitablly highlight the stars and director fawning all over each other and that’s also something we get enough of in the movie.